Viral Hepatitis is the ninth leading cause of death in low and middle-income countries (LMICs) and more than 95% of the 70 million people worldwide infected lack access to treatment due to expensive drug prices. MSF is collaborating with the Drugs for Neglected Diseases initiative (DNDi) on the Strategic Transformation of the Market of Hepatitis C Treatments (STORM-C) project to test a new and affordable drug regimen for Hepatitis C, which has demonstrated a cure rate of 97% in clinical trials. In the following interview, DNDi shares its perspective about this TIC-supported initiative, which is also focused on promoting a public health approach to HCV through innovative models of care and scaling up a ‘test and cure’ strategy that will profoundly impact disease transmission. Tell us about the problem you are trying to solve. Viral hepatitis is the ninth leading cause of mortality worldwide in low- and middle-income countries. Although direct-acting antivirals (DAAs) are available to treat the hepatitis C virus (HCV) with cure rates of 90% or higher, the majority (95%) of the 70 million people worldwide infected with the disease are unaware of their infection and lack access to treatment. Why is that? The major challenges are: the assumption that HCV is too complex to easily diagnose and treat; a lack of resources to promote optimal drug combinations and integrate test-and-treat approaches for public health use in low and middle-income countries; and the expensive price of DAAs, which prevents broader access to treatment. Finally, investment in HCV – either through resource allocation or funding – is insufficient to adequately address the problem. It’s an issue that can’t be ignored – treatment is available yet few patients can access it. What is your solution? What motivates you to work on addressing this problem? The primary goal of the STORM-C project is to promote a public health approach to HCV care and treatment in low- and middle-income countries including Cambodia, Malaysia, the Ukraine, Chile and Belarus. . Beyond this, we are striving to enable national, regional, and global treatment scale-up efforts and ultimately a ‘test and cure’ strategy that will profoundly impact disease transmission. This is being done through simplification of HCV models of care, development of simple and affordable treatment regimens and advocacy. MSF is applying its expertise in developing innovative models of care to meet the needs of patients and scale up treatment. A large-scale “Test & Treat All” implementation study is being carried out in Cambodia, led by MSF, and a second study in Ukraine will shed light on the concomitant health conditions that can affect the outcomes of HCV treatment, such as drug use and HIV co-infection. DNDi brings its research and development (R&D) clout to develop a pan-genotypic, simple-to-use and affordable regimen for HCV – an alternative to current options that will facilitate a public health approach for the disease. DNDi is focusing its R&D work in HCV on a combination of two drugs – ravidasvir and sofosbuvir (RDV/SOF) – to demonstrate efficacy, safety, tolerance, and pharmacokinetics for the treatment of HCV infection. This clinical work is being carried out in Thailand and in Malaysia; the latter country publicly committed to affordable access to HCV treatments for its population through the issuance of a government-use licence for generic SOF in 2017. Together, MSF, DNDi and other partners including Epicentre are attempting to improve the access and affordability of HCV treatments to reach patients in several countries. 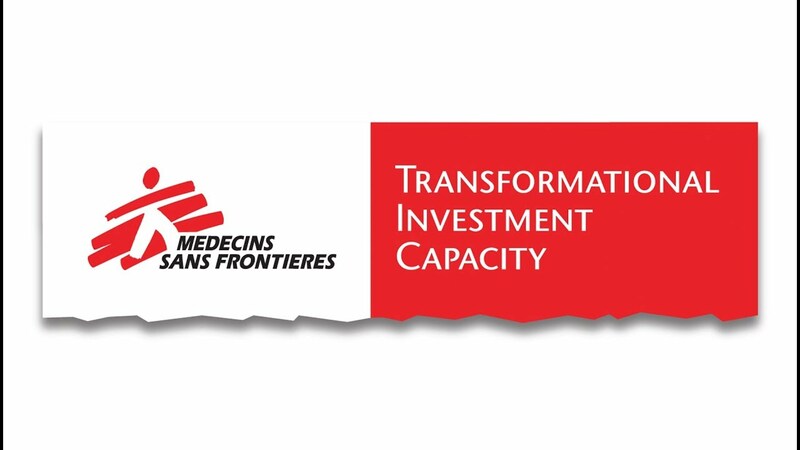 It’s a multi-pronged solution requiring a significant financial commitment shown by MSF’s Transformational Investment Capacity, which has already borne numerous high-level accomplishments since its launch in June 2017. Our motivation to address this problem stems from the wish to have an innovative registration mechanism for new chemical entities in Malaysia, a country that is highly supportive of our work and can be an example for other countries to follow suit. At the same time, we need to pursue the pan-genotypic development of RDV and to encourage pharmaceutical companies like Gilead further to extend voluntary licences to more countries, so that patients can access affordable generic versions of HCV treatments. Finally, we want to push for an alternative way of financing and conducting R&D efficiently and in the public interest to yield affordable end products for all countries. What have you done since your proposal was accepted? The project is going well. Since its launch, the DNDi team has executed several activities, including completing Stage 1 of a Phase III clinical trial on RDV/SOF. This study, involving 301 patients, showed a cure rate of 97% at 12 weeks after treatment completion in patients with genotypes 1, 3 and 6, including those with late-stage liver disease and with HIV. Such promising results position the RDV/SOF combination among the very best hepatitis C therapies available today, which will be available at a fraction of the cost (under $300 USD in middle-income countries where the majority of HCV patients live) of current options (estimated at $4,500 USD for a pan-genotypic treatment in Latin America through the Pan-American Health Organization ). 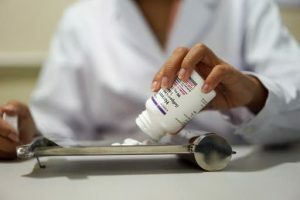 The price is decreasing faster than expected but few countries are on track to meet the World Health Organization’s elimination goals, which aims for 90% of people with HCV to be diagnosed, and 80% of those eligible to be treated by 2030. The STORM-C project supports treatment advocacy and provides the adequate level of funding to address this. 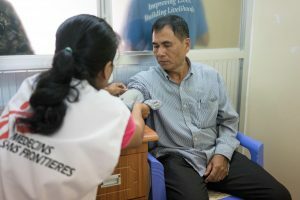 MSF has equally demonstrated its early success on the STORM-C project by providing HCV treatment to more than 7,000 patients in Cambodia and the access project in Ukraine on vulnerable populations like people who inject drugs is also underway. Simplification and scale up of treatment are key goals, which will provide evidence to policymakers on simplified models of care that allow for decentralization to the primary healthcare level, task-shifting and community mobilization. DNDi will support this work by conducting studies in Cambodia and Ukraine to gather further safety and efficacy data on the RDV/SOF treatment, as well as its effectiveness in real-life conditions. The STORM-C project is making many inroads on contributing to price reductions for DAAs in several countries with positive outcomes. Thanks in part to our advocacy work together with MSF Access Campaign and local NGOs, Gilead has extended its “Access Program” for voluntary licences to Ukraine (HCV treatment available for less than $100 USD), Thailand (HCV treatment available for less than $500 USD), Malaysia and Belarus. The STORM-C project team has also supported negotiations with Pharco Pharmaceuticals to lower its price for sofosbuvir-daclatasvir (SOF/DCV), which has helped to foster competition among generic producers to drive down treatment costs even more. Another major highlight of our work is in Malaysia. In September 2017, the STORM-C team provided the critical elements to enable the Malaysian government to arrive at a decision to issue a government-use licence to source generic SOF, which serves as a strong political signal towards HCV elimination and the use of RDV as a public health tool. More recently in March 2018, the Chilean government issued a declaration of public health justifications allowing non-voluntary licences for HCV drugs for reasons of public health. What challenges have you faced? What lessons have you learned? The HCV treatment landscape is a mine field – drugs exist, patients are in need, yet the political and pharmaceutical climate is preventing treatments from reaching those infected in many countries. Therefore, the global burden of this disease remains high. On the clinical side, we’ve faced some challenges including time delays related to the need for a bioequivalence study to validate a new manufacturing process for RDV (due to procurement via a new synthesis route). In Cambodia, the MSF team struggled to find a suitable supply chain of DAAs to meet the demand of patient numbers in the implementation study in Cambodia. This was overcome through an international tender that now enables DAA treatment to be available at $120 USD, as opposed to over $450 USD at the start of the program. A complicated importation and distribution process was encountered in Ukraine for non-registered drugs, which required time to navigate. Another challenge being encountered is based on our efforts to support the registration of RDV in Malaysia. This will mark the first time that Malaysia is the first country of registration for a new chemical entity (NCE), which brings novel hurdles and much responsibility, not to mention a very competitive environment. At the same time, this presents an opportunity to build capacity among our local industrial and clinical partners to gain the expertise for such a venture and draw on this experience for the registration of future NCEs. Finally, challenges are being faced on the advocacy side as the STORM-C project team tries to leverage political support for expanding access to DAAs and for removing IP barriers. For example, DNDi’s work to lobby our pharmaceutical partner, Pharco, to be part of country tenders has forced other generic competitors to offer very low prices to these countries (e.g., this effort resulted in a price of less than $100 USD per treatment in Ukraine). • To optimize political support for improving access to DAAs and for removing IP barriers, an expanded collaboration with local NGOs on advocacy issues is critical. • There’s an imperative need to integrate advocacy messages of HCV diagnostics with treatment, aligned with simplification of HCV models of care. Despite the challenges, knowing that there are patients who still lack access to simple and affordable HCV treatment is what keeps me going. Are there any interesting partners that you are collaborating with? The government of Malaysia has taken a strong stance to support our clinical work. In 2016, DNDi and the Malaysian Ministry of Health began collaborating with a view to usher in a public health approach to HCV, within the framework of the country’s National Strategic Plan on viral hepatitis. The Malaysian government co-sponsored the Stage 1 clinical trial as part of the STORM-C project. Through its government-use licence issued in September 2017, Malaysia implemented a unique patient-centric access strategy. Free HCV care is now provided in select government hospitals, which the government purchases through a local generic manufacturer Pharmaniaga at $300 USD per treatment course. This partnership demonstrates the vital role that political will plays in instilling a public health approach to addressing this disease. What will be the potential impact of your project? What opportunities do you see for the future? There are tremendous opportunities for the future: If this care model and alternative R&D strategy to improve access and affordability of treatments can work for HCV, it may also bear success with other diseases, including cancer, cryptococcal meningitis and others.